Discover shrunken heads, two headed animals or a selfie with your favorite celebrities! Located just 15 minutes west of downtown Dallas, you will experience eye-popping attractions you won't believe! Come see oddities, artwork and unique artifacts from all over the world in our Ripley's Believe It or Not! Odditorium! 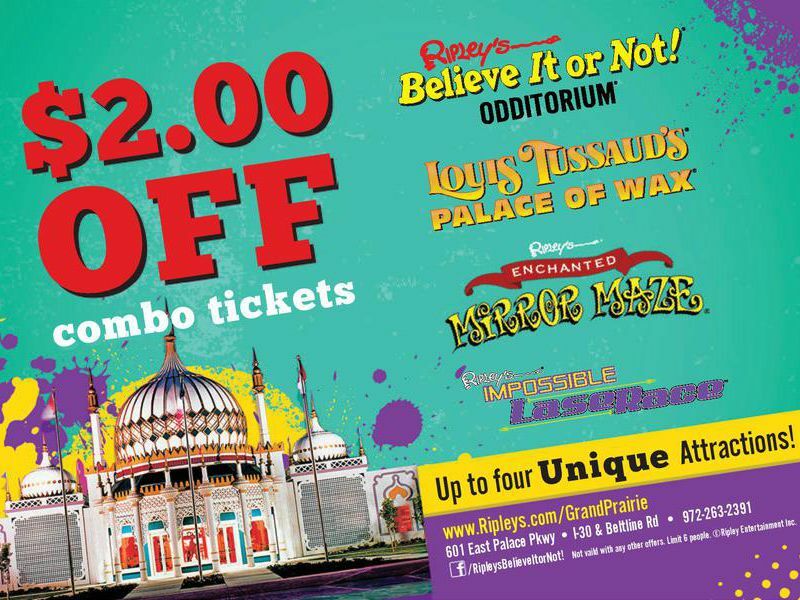 Get lost in our Mirror Maze and dodge lasers in our LaseRace, blast zombies in our 7D Moving Theater and meet the your favorite stars in Louis Tussauds Palace of Wax! Open 365 days a year, we offer group discounts, private parties, special events and anything else you can imagine! Come see us for an experience you will never forget! Fun place for adults and older children. A bit pricey but we spent over 3 hours there and well worth it. Nice rainy day activity. Many rooms to see. Clean and decorated for fun. "Great place for the entire family." What a wonderful place to go exploring. Very good displays to look at, Kids will enjoy looking at everything. "Expensive with lots to do. "